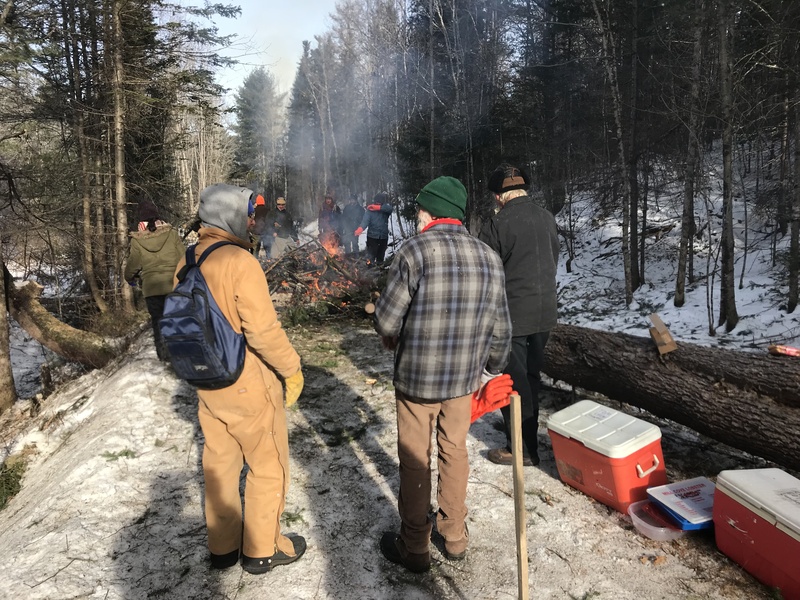 Museum volunteers have been cutting trees and burning slash along our Mountain Extension Saturdays, as seen in this January 19th view. This work will continue on Saturdays in February, weather permitting. The tree clearing will allow us to make right-of-way repairs this summer, in preparation to lay track northward to Trout Brook Bridge and beyond Columbus Day weekend this fall. Our busy winter continues entering February, as work continues on several Museum projects and events! On Saturdays this winter, we gather to clear trees and brush on our Mountain Extension right-of-way. This work will allow us to make right-of-way repairs this summer, in advance of track building come Columbus Day weekend. It’s about 1200 feet from current end of track to Trout Brook Bridge. Last Columbus Day weekend, we laid 1420 feet of track. With the right-of-way prepared, we plan to lay track to Trout Brook Bridge and beyond this coming Columbus Day weekend! Meanwhile, our Sheepscot shops remain busy. Coal stoves and insulation are being installed so our shop crew can work productively throughout the winter in bays 1, 2 and 3. Work is well underway on the Bridgton & Saco River flatcar in bay 2. Once shop preparations are completed, work will resume on locomotive #10’s boiler. Saturdays and Wednesdays are typically our busiest days, with volunteers working on both indoor and outdoor projects, weather permitting. Details on our February work sessions can be found here. Everyone is welcome to stop by, either to watch or to chip in! Our public Sheepscot Valley Winter Service resumes Saturday & Sunday, February 16th & 17th with Steam and Sleighs. Enjoy a horse-drawn sleigh (or wagon) ride, backcountry cross country skiing, snowshoeing, winter hiking, and more at our station stops along your journey. More details, including ticket information, can be found here. Previous PostThank You, Leigh Webb and the Mass Bay RRE!Next PostSteam & Sleighs February 16th & 17th!